Kayaking in Sequim is incomparable to anywhere else. Here, you’ll find a variety of habitats to explore. If you’re an experienced kayaker, you’re welcome to take on the ocean currents and waves, but more timid kayakers might want to stick to the quiet bays. The Dungeness Spit is a wonderful place to spend an afternoon kayaking, and it could not be an easier for guests at our beachfront cottages. 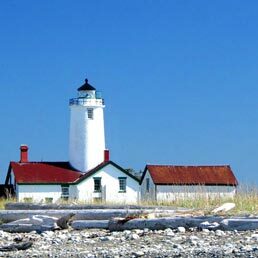 Starting right from our own private beach, you’ll be able to paddle in the protected waters of Dungeness Bay, where you can explore the beautiful Dungeness National Wildlife Refuge. This beautiful refuge is home to thousands of seabirds, and makes for a perfect and relaxing afternoon afloat. You’ll want to make sure you check the refuge’s map for permitted kayaking areas. Depending on your time and experience, you may want to extend your kayaking trip to Discovery Bay. 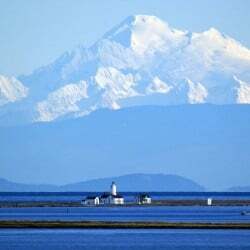 As you travel from Sequim Bay to Discovery Bay, you will pass the wildlife refuge Protection Island, a great place to see wildlife, including harbor and elephant seals that sunbathe on the rocks. You’re welcome to bring your own kayak with you to Sequim, but if you didn’t, there are tours and rentals to help you out. GoXpeditions rents sit-on-top kayaks, extra wide paddleboards, and even pedal equipped kayaks and paddleboards. Adventures Through Kayaking has guided tours designed for beginners and experts. They also provide all the gear and planning, so you can focus on enjoying the adventure without the hassle. 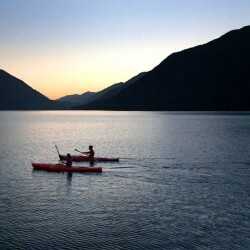 The beautiful waters around Sequim are a kayaking paradise. One taste of this quiet sport, and you will no doubt return for more. Book your room at our private oceanfront cottages today!